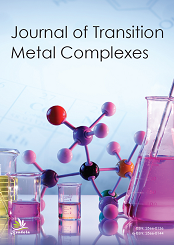 The Journal of Transition Metal Complexes is a scholarly open access, peer-reviewed, and fully refereed journal. It presents original papers, reviews, and communications on all aspects of theoretical and experimental transition metal complex chemistry. Original manuscripts are expected to provide a clear contribution to advances in the chemistry of complexes and applications. Reviews are acceptable in all areas of metal complex chemistry and may focus on the metal, ligand or applications. Reviews concerning coordination chemistry should be developed fully from the basics, carefully relating the topic to the field, and from the literature with a critical view of recent work. The goal of the journal is to improve the understanding of metal complex chemistry issues through the integration of evolutionary principles and perspectives. Articles can specifically consider evolutionary patterns or processes, or simply incorporate an evolutionary perspective into the analysis of a coordination chemistry topic. The journal welcomes submissions over a broad range of disciplines, including mathematical modeling, computer simulation, and comparative studies. The materials published in the Transition Metal Chemistry Journal consider those working in related disciplines, such as chemical engineering, chemical analysis, molecular catalysis, biology, medicine, agriculture, materials science and energetics. For further information, please contact the Editorial Office of JTMC.